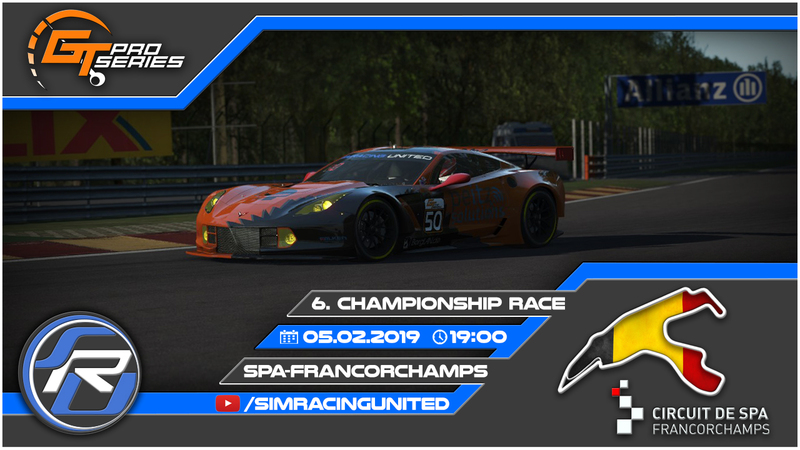 From Azerbaijan to Belgium, from Baku to Spa-Francorchamps... Once again in this season SimRacing United's GT Pro Series hits a highspeed track. But those who think, driving on the well-known roller coaster track is easier than on a very fast street circuit is wrong. The surface in Spa turned out to be very slippery and low downforce setups don't help to keep the cars on the track. This time tire strategies can play a very important role because 3 different strategies are serious options, each providing different advantages, risks and chances. Off course, the fast guys did good lap times as usual, but the training sessions did not show clear favorites for the 6th race of the season. Also the training race left a lot of question marks. So, pretty sure there will be an interesting event in Spa, a lot of hard fights to see and perhaps even some surprises to come. So tune in for the sixth round of the GT Pro series / season 8 on February 05, 2019 from 08:00 pm.